At 54° when we started, and a very light wind, the weather at the lagoon was quite pleasant, despite the numerous dark and threatening clouds all around. Surf was nearly flat, and only a couple ever-hopeful diehards were in the water. Species diversity took an upward bump. A single Brandt’s Cormorant joined the lonely Pelagic Cormorant on the offshore rocks. Reports of Pacific Loons off our coast were supported by the raft of 15 swimming just beyond the surf zone. 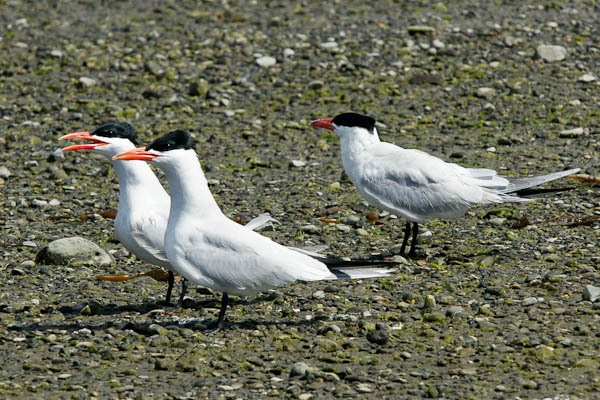 The terns are returning (no pun intended) in small numbers: Caspian, Forster’s, Royal and Elegant joined the 3 Black Skimmers (probably the same 2 adults and 1 juvenile as last month). Again, most of the gulls flew off just as we arrived at the beach; I estimated 1000 of them and added them to the counts. Ducks were down: no Canada Geese, Wigeons, Shovelers or Buffleheads at all, and only 15 Ruddy Ducks. Two of the Ruddys were in bright breeding (alternate) plumage. Double-crested Cormorants – more and more of them sporting their white “eyebrow” crests – were abundant: 90 scattered about, a count second only to 97 on 11/27/05. The Virginia Rail was still in his usual spot in the reed bed near the footbridge to the point near the highway. That’s the 5th month running for what must be the same individual bird. The Soras are still relatively numerous, with at least 4 seen, including one juvenile. The Osprey was back. Perhaps he never left, but we didn’t see it in February, after hosting it October through January. He doesn’t seem to bother the other birds much as they never seem to leap into the air when he cruises by or kites over the lagoon. As the beach breach has been open all winter, there’s probably plenty of mullet hanging around in the deeper waters below the highway bridge. Other signs of spring appeared in addition to the budding trees. Two Western Kingbirds busily hawked insects over the marsh grass and pickleweed, and…TA DA! – a Rufous Hummingbird was discovered among the usual Anna’s and Allen’s Hummers. This is the 1st Rufous we’ve found at the lagoon. They are a common migrant through California this time of year, heading (as I’m sure you know) as far north as Alaska to breed. But it’s hard to separate them from the far more common, and now resident, Allen’s. The green on this bird’s back was so reduced that we felt (fairly) confident in calling it a Rufous. Five Savannah Sparrows were on the sandy edge of the middle channel, next to the pickleweed, which is still covered with bright red tips. Back near the parking lot, 3 Brown-headed Cowbirds were high in the Sycamore tree, looking for mates, no doubt, and generally making pests of themselves. As a reminder to those who plan to come to our 10 am Parent’s & Kids birdwalk, they meet at the beach trail footbridge closest to the parking lot.